This article makes public the details of conversations I have had with personal friends in which they have described in exacting detail the types of very real and actual surviellance footage of myself that the investigators have gathered to date; in other words, despite the set-up attempts, covert druggings, spreading of false and slanderous rumors and otherwise, there do exist real and actual bits of video and audio surviellance that the investigators have compiled from my daily life and routine over the past six years or so. These bits of video and audio surviellance do not demonstrate behaviour out of the norm of the average american citizen; nor does the surviellance footage demonstrate abberance of behavior outside the norm of the same; what the compiled footage does provide to the investigators however, and *only* when coupled with set-up attempts specifically designed to supplement, further, or magnify said content ... is a means of forcing the assumption and appearance of my needing some sort of psychological rehabilitation; or, at the most, an exploration of the need for such: psychotheraphy, regression therapy, discussion of past sexual relations, "is he a stalker?, a potential sociopath/violent offender?, worse?" In other words, "what sorts of forced incrimination attempts would best leverage the existing and rather non-descript actual surviellance that has been acquired? how could we cast it in a more sinister light?" ... or ... "if the target is set up in a way that gives the appearance of his being an obsessive stalker of an ex romantic partner, then what sort of psychological argument could be made if the same target was actually caught on film supposedly 'abusing' his pet?" This article aims to make public my knowledge of the general nature of said acquired surviellance as transferred to me by other personal friends who have been involved at one point or the other with the investigation. Sexual Content: There are several instances of surviellance of myself involved in sexual activity, both with a certain romantic partner as well as other sexual activity such as masturbation, etc. Both such instances or types of activity are mentioned here as I believe both are rather normal process insofar as individual conduct is concerned and therfore I'm quite okay with discussing such things socially and/or publically. This is important to note as a certain variety of persons who have been associated with the investigation come from a field or social sector who almost as a matter of course, subscribe to the popular 12 step/recovery-group sort of notion that any such purely pleasurable or sensual gratification experience such as masturbation (even eating chocolate ice cream) is to be considered a person's mechanism for supposedly avoiding some other more important and perhaps negative emotional 'Issue(tm)" or personal problem. It's somewhat of a gross and self sustaining pschological system of thought in that it, literally, can incorporate any person's activity at any given point in that person's life and subsequently show how that person's behaviors fit within the system of avoidance of negative emotions through sensual gratification; there is always some behavior that fits the bill in other words, which can be argued into this above mentioned method of labeling physical pleasure, whether at the hands of a partner or one's own, as an avoidance of something negative in one's own life or psychological makeup. If a person refuses to operate in such a system, should it come to an actual verbal discussion of behaviors, then assuredly that person is simply "in denial," and even worse off than previously thought. Suffice it to say, however, during the period of living in the above mentioned warehouse flat, I was sexually active on a semi-regular basis and many of such instances of sexual activity were caught on surviellance. 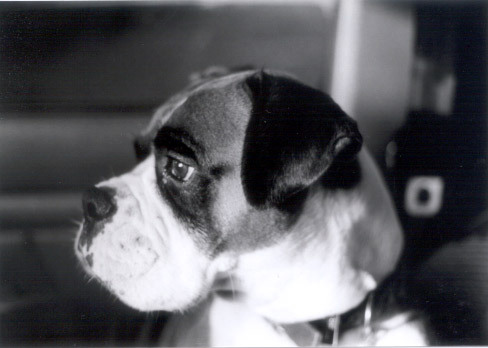 Temper tantrum and pets: Another bit of surviellance caught on tape by the investigators, as relayed to me by others, was a particular afternoon after work when I had arrived to find that my dog at the time, a boxer named mejito, had gotten into the trash and strewn food and trash all over my flat. In response to the above findings, I threw a temper tantrum. Not a regular occurrence by any means ... but it was a genuine over reaction on my part and perhaps I did discipline the animal moreso than was necessary; however, no lasting physical harm, beyond a few good pops and perhaps a bit of trash-can-related psychological trauma was endured by the animal. 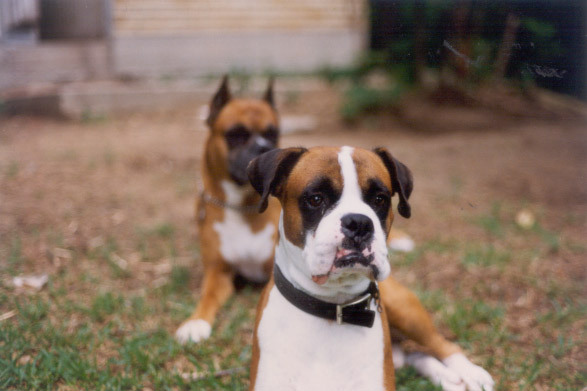 I've had two generations of boxers, mejito being the last, and there are plenty persons within my own family and social circles that I have lived with over the past 18 years to testify to not only my own temperment towards the animals but also and perhaps more importantly the temperment, personality and poise of the dogs themselves. Fine animals, both ... well behaved and far from ever being abused and or mis-treated in such a way as to affect their relationship with me or others human beings; anyone who has spent time with dogs is familiar with the type of animal who has been abused; it is obvious in their mannerism and reactions to human contact. This, however, as isolated of an event as it is, is a very important bit of surviellance footage as it draws a hard line between myself and one of the most stereotypical psychological models in the so-called "science" of profiling ... the connection between animal abuse and potential abuse of another human being. From the abusive father who also abused his animals, right up to the serial killer who tortured small animals as a young child ... there is perhaps no more frequently discussed connection between adult violent offenders and their respective treatment of animals. Alone, this video footage is fairly un-exceptional, but were a criminal set-up of myself to ever be successful, such as my being covertly drugged or wrongfully incarcerated and then a subsequent search of my premises turn up items supposedly stolen from an ex-girlfriends or friends house ... ahhhh, THEN a much more sinister psychological argument could be made in a court room setting. "This is such a classic case!, the defendant, obviously obsessed with some person or the other and though not having shown violent tendencies towards the object of his obsession, may well, no ... is even *likely* too eventually escalate his attentions to a violent level! We know this because there exists a wealth of statistical data mirroring his profile and or progression in his obsession ... and just look at the way he treats his animals! Those who abuse animals, rarely stop there, your honor ... again, the statistics are there!". That's how it would most likely go, anyway; which is why I discuss this personal matter publically. Guns: Another bit of surviellance footage, though quite humorous, nonetheless also plays into the investigators desires to somehow build an image of myself as a possible future violent offender; this footage involves handguns. For the record, I have never owned personal firearms, although such devices have been in and around me, in my family, etc. ... since I can remember. Rifles, shotguns, pistols ... I grew up around such devices as my parent and other immediate family were always into hunting. Upon moving into the above mentioned warehouse flat, I borrowed a .9mm pistol from my father because I was a bit wary of living alone and in that area of Houston. I had been held up at gun point, twice in the previous two years, in and around certain Houston locales and I was a bit traumatized by the experience. Having handled weapons before, I felt quite comfortable and a bit more safe having a handgun sitting on my bedside bureau at night. Anyway, long story shot, while hanging out in my flat I would sometimes handle the weapon, pointing here and there, assuming ridiculous defensive postures, etc ... practicing it's usage and more importantly, being quite dramatic about it at times. I've seen my share of Bruce Willis movies ... and I'm sure it shows in this bit of discussed video footage. I was having fun, in other words. Upon moving from that space, I returned the weapon to my father ... in the end, being more comfortable without a weapon in the house than with one. As with much of the video surviellance discussed in this article, the investigators, after some sort of set-up event might intend to skew this harmless bit of footage in a manner which would claim such behavior is worrisome or indicative of possible future harmful behavior. Sexual Content: For a year or more, when the gang stalking tactics of the investigation were the most severe and when I was the most emotionally debilitated by such actions, I lived with my father. He, of course, believed (and still believes!) that no such investigation ever existed and that his poor son was simply cracking up. This was the period in which his personal friends involved in local and federal law enforcement were doing everything in their power to convince him to convince me to sign my right's over to the state as a mental patient ... something I absolutely refused to do ... and with good reason. That said, it has been known to me that material of a sexual nature was gathered while I lived there and since I had no romantic partners at the time ... it would only involve activity such as masturbation, etc. ... which occasionally, though not regularly, did indeed occur. Again, this footage contains nothing out of the ordinary from normal and acceptable personal behavior and therefore I will state no more than that said footage was gathered from his residence during my stay there. Suicide Note: Prior to making this bit of personal knowledge public, I should state that this is a topic I have discussed previously, many times over, with certain friends and family who have acted as my personal witnesses over the past six or so years. It is no secret that quite a few years ago, while in a period of severe duress brought on by the investigations tactics, I contemplated suicide ... even wrote a suicide note. While staying at my fathers, around early 2001 or so, I was experiencing what could only be called severe emotional and mental duress from the constant surviellance and semi-regular covert druggings; furthermore, I had no idea how I could solve my problem at the time ... this being prior to my learning of certain legal avenues available to me; furthermore, this was a time prior to any of my personal friends coming forward to confide in me, if only privately, their personal knowledge of the investigation. I was literally surrounded at that time by personal friends of my father's who not only knew about the investigation and had been acting as participants in the same ... but in fact and much more horribly had been all the while whispering in his ear that I was simply deranged, becoming severely mentally ill and should immediately begin taking a whole gamut of anti-psychotic and anti-depressant medications; these same person's were even giving my family members instructions on where and how I could sign myself over as a mental 'ward of the state.' A terribly traumatic and terrifying time. I was at my wit's end and felt as though there were no solutions to my circumstances at the time. Long story short ... one night, when my emotional state was particularly bad, I actually penned a suicide note on my computer. It was lengthy, honest, and addressed individually, each and every member of my immediate family in an attempt to give them what could only be called a final farewell. The point of stating all this ... it has been recently brought to my attention by certain of my personal friends that the investigators attempted to coerce them into participating in the investigation by showing them this suicide note (early 2002) as an indication of my supposed need for mental health treatment. Suffice it to say ... there is no way then nor now that I could take my own life and so after a sound night's sleep I eventually ended up laughing at what I had written. Furthermore, it should be stated that the above mentioned events occurred in a much earlier period of my current circumstances when I could'nt even hold down a daily job due to the emotional duress brought on by the gang stalking like tactics of the investigation. In other words ... the historical timeframe of my being so distressed as to consider suicide should be at the forefront of your mind when reading this portion of this article. The reason for such occasional private diatribes is this: My goal is to prove an investigation of myself exists; therefore, if *any* surviellance footage is ever used or displayed publically, then my goal will be met. Contrary to popular opinion and the claims made to my personal friends who have acted as informants, ... I do not seek millions in recompense for the physical and emotional damage inflicted by a rather horrifying tactic-model employed by the investigators ... I seek simply to acquire proof that such an investigation exists and all related documentation related to said investigation (as allowed my provision under the Freedom of Information Act). Therefore, when in certain environments which have been indicated to me as those wherein surviellance has been gathered ... I often times carry on dialogue with myself in a manner that is solely designed to agitate/entice the investigators.
" As an example, suppose you cursed the pigs, just in your head, sometimes. If you get them angry they sometimes screw up. Say you were taunting them by asking them whether they picked up your thoughts in Niger (as an random example of a far-off place). By the way, you can taunt them all you want in your head, since it is only you and the Nazis there. Likewise, curse the pigs that bug your house all you want. They just do not seem to understand that if they reveal anything they know about your private mentation or private conversations in your home they cannot call you crazy. It would be like entering the FBI tapes of Martin Luther King saying the FBI was out to get him as evidence that he was paranoid. "